Slip stitches crop up all over the place when you're following a pattern. 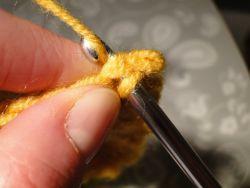 They're often used as a joining stitch for a circle, or when you're putting two pieces together. It can also be used to edge your work. 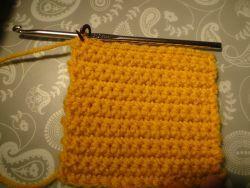 I'm going to start this tutorial with the square that we made on the single crochet page. If you haven't made this, no worries. 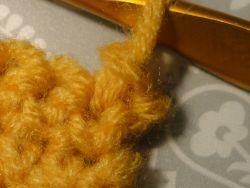 Simply crochet a chain and do a few rows of single crochet. 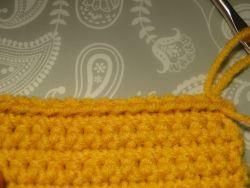 This will give us a nice, solid foundation to work with, as slip stitch can be a little fiddly to work first time round. 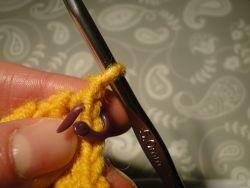 You'll notice the stitch marker in the last stitch of that row. 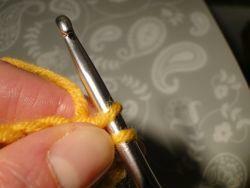 That will help us see where to work the first slip stitch. 1. First make one chain to turn. 2. Turn your work. 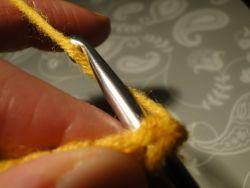 Take the marker out of the stitch, which is now the first stitch of our new row. 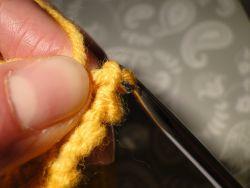 Once you get the hang of this, you simply pull the yarn through the two loops of the stitch, as well as the loop on your hook, all in one movement. 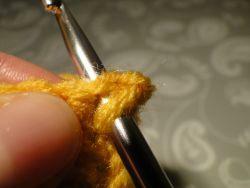 You may feel as though the yarn is pulling against you, and that once you've pulled the yarn through the stitch, it's very hard to then pull it through the loop on your hook. This is why I try to keep things a tiny bit loose, not holding the yarn too tight. I pull the yarn through the stitch, then sometimes take a tiny breather and straighten up my hook, then go for the final pull-through of the top loop through the bottom loop on my hook! 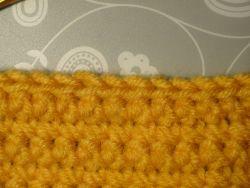 It's actually quite rare to work a whole row of slip stitch. 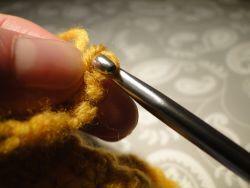 Usually you'll work only one stitch, to join a circle, for example. It gives a slightly ridged edge here - a good effect!